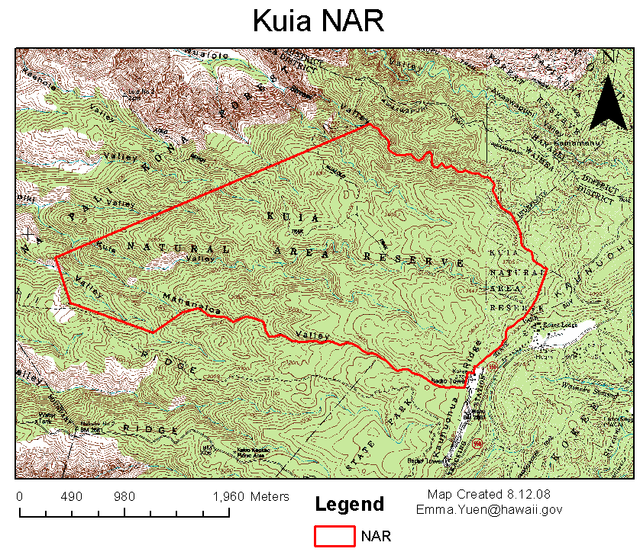 Kuia Natural Area Reserve occupies 1,636 acres in the Waimea district of Kaua‘i. Elevation ranges from 2,000 to 3,900 feet, encompassing lowland and montane vegetation types (communities). Many rare plant taxa are found within the Reserve’s mesic and wet forests. The Kuia Reserve protects important rare native communities and associated rare species. Two of the native natural communities are considered rare, as they are known from less than 20 locations worldwide. The Reserve is used by the public for hiking and hunting; Nualolo Trail is a frequently hiked trail.